The Warehouse District just got a dose of chic, new dining options! Auction House Market, a new community living and eating space has come to the New Orleans CBD. The Auction House Market was created by the same masterminds who created St. Roch’s Market, the wildly popular communal food hall in New Orleans’ up-and-coming Bywater neighborhood. The Auction House Market food hall is now open for breakfast, lunch and dinner daily and features nine food and drink vendors in addition to the hip cocktail bar, The Mayhaw. The Market's lower level features a sleekly-designed, multi-vendor food hall and the upper level features stunning 1 & 2 bedroom lofts, steps away from the Warehouse District's vibrant restaurant and retail scene. Aloha Lei is a sushi and poke concept from couple Tracey Davenport and Dave Kirtland. 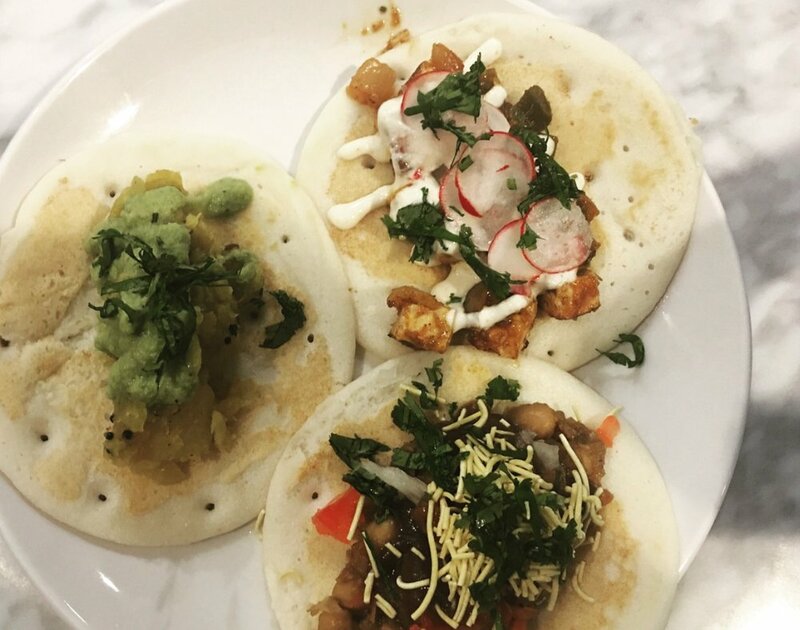 Tava, an Indian dosa concept from chef Manish Patel, will serve the pancakelike dish with a variety of flavors and fillings, including a chaat dosa made with garbanzo beans and served with a tamarind and date chutney. Empanola is an empanada vendor from Patricio Garcia and Jimena Urrutia that moved from St. Roch Market. Coast Roast Coffee, from local roaster and coffee shop owner Kevin Pedeaux (who also has a stand at St. Roch Market), will serve coffee drinks such as classic drip, iced and frozen coffees. HAPPY JAXX, a health-focused concept from chef Patrick Kearney, includes teas, salads, and toasts, such as a curry toast topped with vegetable dal, mint and an Indian yogurt sauce. SOLA Deli, from chef Camdon Richardson, features an “internationally-inspired and Louisiana-themed deli-concept,” with sandwiches filled with cured and cooked meats, aioli, pickles and jellies. Elysian Seafood, from couple Brandon Blackwell and Jennifer Sherrod (also at St. Roch Market) has a seafood counter with an oyster bar theme serving Gulf oysters raw or char-broiled and dishes like marinated crab claws and shrimp cocktail. Long Chim, is the place to go for authentic Thai food that uses fresh, local ingredient whenever possible! Long Chim has options to suit all tastes: vegans and meat-eaters alike! Mac and Moon serves a variety of sweet treats and desserts, as well as delicious herbal teas. Mac and Moon’s specialty is their delicate, French macaroons, but they also sell cream tarts, rolled ice cream and milkshakes - with vegan and gluten free options as well! To stay up-to-date on all of the Astrid Solo Travel Advisor's travel tips, affordable luxury ideas, products and services follow us on Instagram, Facebook and Twitter. To get these tips and the behind-the-scenes look at my recent trips, sign up for our monthly newsletter below!